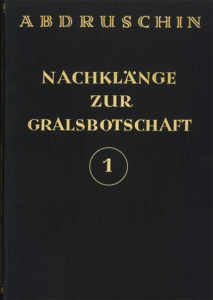 After the publishing of the “large edition” of the Grail Message in the year 1931 – so called in contrast to the “small edition” of 1926, – 59 serialised individual lectures were published up to 1934. 10. All that is dead in Creation shall be awakened, so that it may pass judgement on itself! 26. Behold, man, how you should wander through this Creation, so that the threads of fate will not hinder but further your ascent! 33. Let there be Light! 34. Man, how do you stand! 41. Whoever will not acknowledge my Word now, for the sake of another, the same will I not acknowledge in the hour of his suffering! 48. Threads of Light above You! 54. Ask, and it shall be given onto you! 58. And when Mankind asks …. A further 38 individual lectures (Nos. 60–97) were published as such between 1934 and 1937, and were available for purchase. They were published by “Der Ruf” publishing company LLC, Munich, and later on by a self-publishing organisation on Vomperberg: the Maria Bernhardt publishing company, Vomperberg. Abd-ru-shin had already released some of these lectures, duplicated in the form in which he had originally dictated them, before assigning to the second revised version the same serial number for dissemination. The lectures “The Primordial Spiritual Planes I to VII” were previously released under the title “The Spiritual Planes I to VII”. For example, the first reading of the lecture “The Spiritual Planes V” took place on 22 April 1935 and it was released in this version shortly thereafter. The revised version, entitled “The Primordial Spiritual Planes V”, was released in 1936/37. Lecture No. 73, “Easter 1935”, was released by Abd-ru-shin under the title “The Book of Life”, and lecture No. 80, “Pentecost 1935”, under the title “The Living Word”. There also followed the still unnumbered individual lectures “Pentecost”, “Everything must become New!” and “The Mountain of Salvation”. 60. The gate is opened! 65. Consider what is of benefit to you! 90. When the need is greatest, God’s help is nearest to you! 96. Do not fall in temptation! The author may have originally planned to compile a second volume of “Reverberations of the Grail Message” from these individual lectures. As a result of both the historical and the spiritual development, this never happened. Should such an edition of “Reverberations of the Grail Message” Volume II currently be in circulation, there is no way that it could it be authentic. The increasing publishing difficulties of “Der Ruf” publishing company LLC., Munich, due to the ever-increasing pressure of the National Socialist regime, caused Abd-ru-shin to publish ten further lectures and “Questions and Answers” in the year 1937 in the magazine “Die Stimme” (The Voice) issued by “Die Stimme” publishing company AG, Zurich. 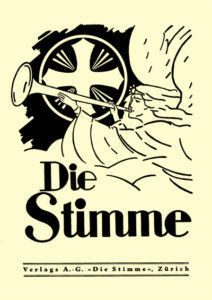 In the last booklets of the magazine “Die Stimme” hints were made about the increasingly difficult market conditions and it was explained that the appearance of the next booklet would have to be postponed to July 1938. Neither the publishing of further “Die Stimme” booklets nor the eventual release of a Volume II of the “Reverberations of the Grail Message” could be achieved. In March 1938, the imprisonment of Abd-ru-shin by the National Socialists took place. In September 1938, this was followed by banishment from the annexed Austria, first to Schlauroth near Görlitz, and in March 1939 to Kipsdorf (Erz mountains).